A 23-year-old woman is providing training in karate to youths, particularly females so that they could protect themselves from teasing and stalkers. Subrati Baraik, a resident of Madhu Tea Estate, is running a karate camp in Jaigaon and training youths for their own safety. Baraik told Metro that she had decided to learn karate after being repeatedly teased by youths at different places. "Eight years ago, I was teased by some youths while travelling on a train. I was returning home from Siliguri. When I tried to resist them, they passed lewd comments. After few months, a similar incident occurred again at a fair. I felt insulted after both these incidents and decided to learn karate for my safety," she said. In 2010, Baraik came to Alipurduar town and met Apra Bora, a karate coach. "I requested him to teach karate and he started training me. In December 2015, I participated in a National Karate Championship in Hoogly and came first in 'Kiyukishan Full Body Contact' category," she added. In Jaigaon, located on India-Bhutan boarder and 15km from here, Baraik teaches karate to 20 students, of whom 15 are females. "I started a camp around three years ago in Jaigaon. I came here with my coach and the urge to learn karate among students made me start the camp. I charge Rs 200 per month for a student,"she said. Classes are conducted from 8am to 9.30am on Sundays. Baraik said after learning karate, she had once beaten up a group of youths who were teasing her and also wanted her friends residing in the estate to learn the same. "I could study till Class X because of financial crisis in the family. I have decided to teach karate to the youth in the garden but it will take time to convince them as they are very shy," she said. Baraik holds brown belt in karate. Apra Bora, Baraik's coach, said: "She is really talented. If she does training with a lot of sincerity, she will be able to win more championships." A 23-year-old woman is providing training in karate to youths, particularly females so that they could protect themselves from teasing and stalkers. 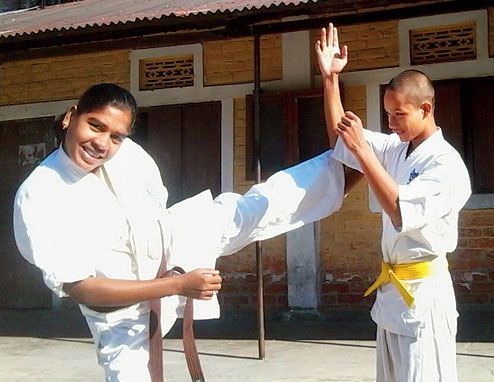 Subrati Baraik, a resident of Madhu Tea Estate, is running a karate camp in Jaigaon and training youths for their own safety.